Turkish President Recep Tayyip Erdogan (L) and Saudi King Salman bin Abdul Aziz Al Saud pose for a photo during their meeting in Riyadh, Saudi Arabia, in this picture released, Dec. 29, 2015 by the office of the Saudi Press Agency. Turkish President Recep Tayyip Erdogan met in Saudi Arabia Tuesday with King Salman for talks that were expected to focus on Ankara’s support of Riyadh's military as well as Syria's civil war. With Ankara facing increasing isolation in the region, Riyadh is seen as increasingly important ally. The two countries are among the strongest backers of Syrian rebels fighting Syrian President Bashar al-Assad. Both Riyadh and Ankara have also taken a hard line in calling for Assad’s immediate removal. But such stances have increasingly isolated Turkey in the region. It also faces high tensions with Moscow since last month’s downing of a Russian bomber by Turkish jets. Security analyst Metehan Demir says such isolation is a key factor behind Erdogan’s visit. FILE - This frame grab from video by Haberturk TV, shows smoke from a Russian warplane after crashing on a hill as seen from Hatay province, Turkey, Nov. 24, 2015. "In the recent period, Turkey’s relation with the West, Russia and United States, were not that bright, therefore Turkey has been seeking allies, both in the Middle East and also Arab lands as well. The Saudi visit should be considered under this context. But of course there are some critical points Saudi and Turkey do not agree on," said Demir. The Turkish president is expected to be looking for Saudi assistance in his efforts to reduce Turkey’s dependency on Russian energy. But Erdogan also has something to give. He is supporting the Saudi initiative of an Islamic military coalition to fight terrorism. NATO member Turkey has one of the largest and best equipped armies in the region. 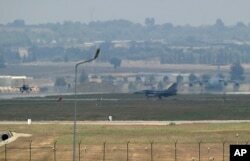 FILE - Turkish Air Force fighter planes maneuver on the runway at the Incirlik Air Base, in Adana, southern Turkey, Aug. 13, 2015. But Sinan Ulgen, a visiting scholar at the Carnegie Institute in Brussels, warns that, with the alliance made up of only Sunni Muslim countries, it is being viewed as primarily aimed at Iran. "The risk of sectarian polarization fueled on the one hand by Riyadh and on the other by Tehran has certainly increased. And here obviously there is a threat to Turkey, with Saudi Arabia wanting to pull Turkey on its side," said Ulgen. But with Erdogan increasingly ramping up criticism of Tehran, accusing it of forming an alliance with Moscow against Turkey, observers say Ankara may have already chosen which side it is on in the deepening sectarian divide in the region.